Last December, my cousin Achi Leslie (www.shootfirsteatlater.com) invited us for lunch so that she'll be able to have a first glance at the iPad mini before she got hold of hers. The restaurant of choice was King Chef, knowing that it was a Chinese resto, I wasn't really expecting anything. The place looked like the typical Chinese resto, the tables and chairs were arranged in a banquet style. On the way there, we pretty much had an idea on what to order. One of the first thing that caught my attention was the Drunken Shrimps. The Drunken Shrimps I tasted in Macau still remains to be the most unforgettable. Before ordering it, I asked the server on how process on how they prepare the dish. The process was similar to Macau's version. They brought out around a quarter kilo of shrimps and placed it in a clay pot. The shrimps were actively scampering around, an indication that it was live and fresh. They brought out bottles of Chinese Wine and pour it on a stainless boat shaped sauce pourer. They ignited the wine and poured it on the clay pot. The server started to mix everything as the flames engulfs and cooks the shrimps. I was so excited as I was about to take my first bite, I was hoping that the shrimps would taste similar to what I had in Macau. Unfortunately it wasn't, the shrimps weren't cooked long enough, the alcohol taste hasn't totally evaporated, leaving a very strong flavor of it in every bite.Looks promising but a big disappointment. The half order of roast duck tasted just ok. The meat was tender but lacked the crisp fatty skin. Written on the menu, the Crab Rice was supposed to be glutenous. But when the dish came out it wasn't, it was like ordinary fried rice. Achi Les being a fan of glutenous rice was disappointed though I enjoyed picking on the small pieces of crab. The French String Beans with Ground Pork tasted good. The string beans still had a nice crunch into it and the ratio between the vegetable and meat was just right. The Superior Seafood Hotpot looked pretty good but it was under seasoned. I liked how the seafood and vegetables were cooked properly, the whole thing was just so bland. The Salt and Pepper Frog Legs would have been nice, the meat was so tender, there was a lot of garlic and chilies that topped the fried frog legs. Problem is, it left an aftertaste of rancid oil. I thoroughly enjoyed lunch but it wasn't because of the food, it was because of the great company. Thanks Achi Les for lunch! I'm pretty sure we'll find a better place to dine next time. Galileo Enoteca Deli is said to be a great place to have wine and feast on great food at the same time. I looked forward in dining here and have a first hand experience to find out if what people were saying was true. I really liked how the deli/resto looked like, it felt like being inside a wine tavern. It had a cozy, warm and intimate ambiance. We started the meal with a complimentary plate of warm bread with a chicken liver pate and an olive oil balsamic vinegar dip. The meal started on a good note because the pate was SO GOOD!!! The creamy smooth texture and the balance of the sweetness, saltiness and tinge of bitterness was spot on. Hands down, one of the best I've tasted. The wine we had was a big disappointment. The bottle of Il Poggio Dei Vigneti Sangiovese tasted so flat, the Italian brand medium-bodied wine didn't have any character. Together with the wine, we had the 60grams of Assorted Cheese, the Pecorino, Provolone and Asiago. For a couple of slices of cheese, I found it too pricey. I've read that the store sells real buffalo mozzarella cheese, I was looking forward in tasting it again but sadly it was out of stock. If only the wine tasted better, I felt that we could have enjoyed the cheese more. The Red Frutti de Mare Pasta was an absolute delight, it was lovely. The pasta was al dente, it just had the right amount of toppings and the Pomodoro sauce had that harmonious sour and sweet flavor coming from the tomatoes. We were having forkful of the pasta one after another. I wished I carefully read the menu better before ordering cause I didn't like the Salmon Marinated in White Wine. Written below the dish it read, 'baked salmon marinated in white wine, sprinkle with honey and nuts'. I was so taken aback when I took my first bite off the fish, it tasted oddly sweet. It was so sweet that it made me cringe, we had to add a lot of salt to be able to finish the slice of salmon. This was my first and only time that I got to taste fish prepared in this manner. Though the salmon was perfectly cooked, this for me tasted so wrong. Though the fish dish was a major disaster, I would still go back and try out more of Galileo's other dishes. The Chicken Liver Pate and Pasta dish was delicious and of excellent quality, I'm pretty sure I just ordered the wrong thing. Next time around, I would ask for their bestsellers and the right wine to pair with it. After visiting the dolphins in MOAP, we rode a bus and headed for Dapitan City, Zambaoanga Del Norte. There were different resorts in the area but we chose to go to the most popular, Dakak Park and Beach Resort. 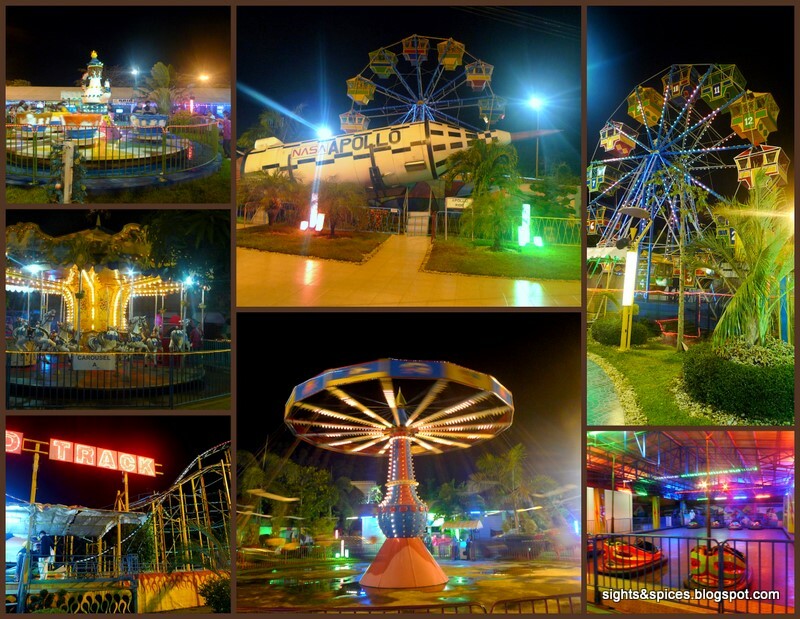 Our stay includes entrance to Gloria's Fantasyland, a theme park that serves as one of Dapitan's main attraction. We used our free entrance pass before going to the resort the next day. Though the theme park is relatively small, it was still nice strolling around the grounds. The theme park had a festive atmosphere. The next morning we were picked up by a chauffeured van and made our way to the resort. Upon arrival, welcome drinks was served and we were given a printed map of the whole resort. My first impression of the resort was that the whole place was covered in beautiful groomed lawns, plants and trees. Motorized carts brought us to our room and the driver told us that they can drive us around if we wanted to check out places within the resort. The rooms looked like kubos or huts, rooms were spaciously separated from each other, it gave a nice sense of privacy. Inside the room, the furniture and fixtures also followed the 'kubo' theme. I enjoyed hanging out in the veranda, lounging around while taking in the breeze and view. We went around to check out the various activities that the resort offered. The resort has two adult pools and one kiddie pool. A ten pin and duck pin bowling alleys plus pool tables. A small spa area but you can always have your massage in your own room. Dakak boast of now holding the record for Asia'a longest dual zip line, it stretches out to 1.3 kilometers. An Aqua Sports center which offers various water sport activities. There was a trekking path going up the hill where one can see the top view of the resort. There were different restaurants and bars around. Il Patio serves Italian cuisine. The Bamboo Cafe fronting the beach serves different local and international food. The Pirates Disco Bar looked so cool since the whole bar is shaped into a pirate ship. We did't get to do much of the activities cause we were there to relax and chill out. And the perfect place to do it was on the beach. The private beach area was so beautiful, the white sand was so smooth and fine. There were no small pebbles or stones, I loved walking around barefoot. The waters were calm and crsytal clear, it felt so refreshing dipping and swimming around. I think I might have spend 70% of my time hanging around the beach for the whole duration of our stay. I heard people say that Dakak is already debilitated but after being there I beg to disagree. Though there are some areas in the resort that looks kind of old, the resort is well maintained and it still remains beautiful. It was a perfect place to relax and unwind.